Ever thought about going to Antarctica? What would it take to survive there? What kinds of people work there? Lucy Jane Bledsoe found out. During her trips to Antarctica she's explored many different research bases, slept on glaciers, and seen wild animals up close. 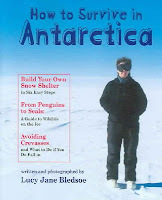 In How to Survive in Antarctica she shares her adventures, tips for traveling in the Antarctic, and facts about the people and animals that live there. This book is a smorgasbord of information and photographs illustrating life in this harshest of continents. Bledsoe provides fun facts about Antarctica and its history, highlighting special places and people who explored the continent. Did you know that the Boy Scouts has sent scouts to Antarctica with their Antarctic Scientific Program? Can you identify the four species of penguin that live on Antarctica? Did you know that human waste is transported back to the United States every year so that humans don't contaminate the environment? The text is chopped up into short, manageable pieces, intermingling scientific facts with historical information and Bledsoe's personal accounts of her own adventures. Black and white photographs and drawings accompany the text. Bledsoe also highlights some of the people that work on the continent or have explored the continent. I'd hand this to any middle-grade kid interested in adventure and exploring. The book contains a glossary, but no index or source list. While it might not be the best choice for reports, the materials is certainly appealing enough to make great browsing material. Happy Nonfiction Monday! Head on over to MotherReader's for the roundup. Sounds like a great book - and I didn't know any of those facts. Plus today, the idea of cold sounds really, really good.